The National Theatre, which is located on the western end of Mary’s Street, was an important part of German bourgeois life in the 19th century. When the German citizens were assimilated in the second half of the century, it lost most of its audience and was closed by the town magistrate in 1868 “to save the Hungarian language”. 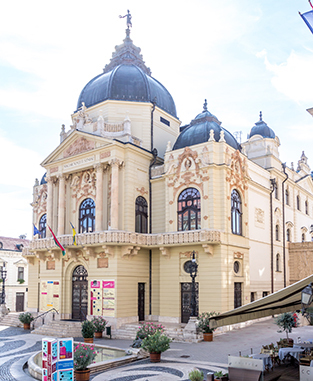 After that, Pécs had no steady theatre and ensemble for a quarter of a century. Today’s theatre was built in 1895 according to plans of the two architects Anton Steinhardt from Budapest and Adolf Lang from Prague. Both were educated in Vienna and the town hall on Király Street, built in 1905-1906, was designed by Adolf Lang as well. The theatre’s Tympanum bears the title “Hungarian National Theatere”, which reflects the zeitgeist at that time. The National Theatre one hundred years later.